Mumbai: The 1st Mumbai Edition of Women of India Organic Festival 2018, sponsored by the Union Ministry of Women & Child Development and organized by Mahila Aarthik Vikas Mahamandal (MAVIM) culminated at World Trade Centre, Mumbai. The total sales recorded were over Rs. 65 lakhs of these 300 women farmers and entrepreneurs who came from the remotest parts entailing 25 States to sell and popularise their wholesome produce in the financial capital of India. The Women of India Organic Festival 2018 was inaugurated by Brand Ambassador and Actor, Ms. Juhi Chawla who has been associated with a number of meaningful social causes in India as well as internationally. In 2015, she was bestowed with the Indira Gandhi Memorial Award in Social Awareness. Joining her to inaugurate the Festival were Maharashtra Minister of Women and Child Development, Ms. Pankaja Munde, Minister of State, Women and Child Development (Maharashtra), Ms. Vidya Thakur, Actors, Jackie Shroff, Tanujaa, Tanisha Mukerji, Madhoo Shah, Fitness & Nutrition Expert, Deanne Pandey and Food Critic, Rashmi Uday Singh. Organized in Delhi on an annual basis by the Union Ministry of Women & Child Development since 2015, the 1st Mumbai edition of Women of India Organic Festival 2018, celebrated and promoted women farmers and entrepreneurs in the organic field from across India. As a result, Mumbai’s World Trade Centre was the premier hub of India’s biggest offerings of organic products ranging from food, kitchen products, spices, pure fabrics to wellness, personal care and solar products for these 5 days from March 16th to 20th. 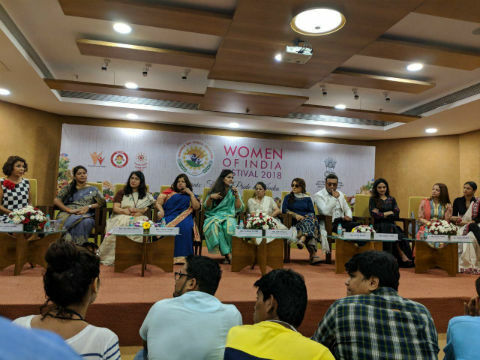 Participants from the remotest parts of the country travelled and stayed in Mumbai as guests of the Union Ministry of Women & Child Development for the entire duration of the Festival. After the growing success and popularity observed at last year’s Women of India (WOI) Organic Festival in Delhi, the Ministry took the initiative to Mumbai. Organic farming relies on techniques such as crop rotation, green manure, compost, vermiculture and natural methods of pest control. Further, ongoing research indicates that wild plants and birds are much more abundant around organic farms than around conventional ones. Organic plants and food crops have also contain higher amounts of salicylic acid which fights bowel cancer and the hardening of arteries that leads to heart conditions, strokes and other ailments. Ms. Juhi Chawla, the Brand Ambassador of the Festival expressed her wholehearted interest and support, “The festival was intended to highlight the health and environmental advantages of organic goods, provide a platform for women engaged in it and boost the development of sustainable and easily accessible sales outlets for women producers from the remotest corners of India. Our environment is one of my priorities and I like to associate myself with causes that resonate with me.” Ms. Chawla herself participated in the Women of India Organic Festival with her stall, ‘Juhi’s Organic’. She got tremendous response as the entire merchandise of fresh fruits and vegetables sourced from her 2 organic farms on the outskirts of Mumbai was sold off on the second day of the Festival itself. The Festival had participants from Maharashtra, Gujarat, Sikkim, Uttarakhand, Himachal Pradesh, Tamil Nadu, Karnataka, Kerala, Odisha, West Bengal, Bihar, Delhi, NCR, Madhya Pradesh, Uttar Pradesh, Punjab, Haryana, Arunachal Pradesh, Andhra Pradesh, Jharkhand, Chhattisgarh, Assam, Kashmir, Telangana, Rajasthan, Nagaland, Mizoram, Meghalaya and Manipur. Organic produce such as cereals, rice, pulses, spices, cosmetics, household products, pickles, organic ice cream, oils, honey, tea, hair care, bath care, beauty care, aromatherapy products, solar products, kitchen composters, organic cotton fabric, linen, organic seeds and other bio products met with a thumping response from Mumbaikars as they walked out with trolleys full of the exotic products on sale. The 5-day Festival with more than 150 stalls selling organic produce had people coming in droves on all days thereby giving immense encouragement to the sincere efforts of all participants. The main aim of the Festival was to support and encourage women and women-led groups that promote organic farming, thus supporting their local community’s economy, creating jobs and keeping farmers thriving, in addition to spreading awareness about the benefits of organic products for consumers.